The Minnesota Vikings had the No. 1-ranked defense in the NFL in 2017, finishing second overall both against the run and the pass. The Vikings' defense is similar to the Eagles', in that they rely on their front four to get to the quarterback. "I think they are the best defense we've faced this year and I think one of the reasons why is they can get pressure with four and cover with seven," Frank Reich explained on Tuesday. "Any time you can get pressure with four and cover with seven, that's kind of been the key to our defensive success. That's a winning formula. That's been a proven winning formula for a long time, so I think this week is a good test of that." Five sacks on 487 pass blocking snaps isn't Demetrius Bell-level bad, but clearly, Vaitai is the only questionable blocker on the Eagles' OL. 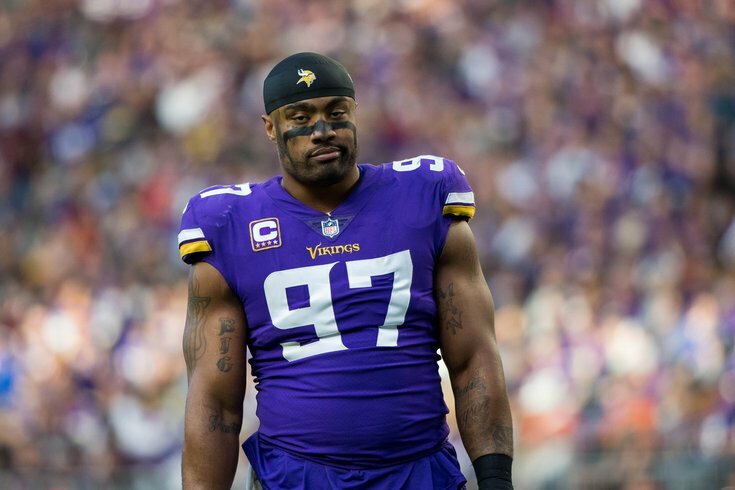 He'll also have the most difficult assignment on Sunday in DE Everson Griffen, who was tied for fourth in the NFL with 13 sacks. "97, he's a game wrecker," said Doug Pederson, when asked what stood out about the Vikings' defense in general. "He's definitely a premiere pass rusher and player in general," said Reich. "He's had a great year. He's been a great player for a long time. So you've got to account for him. You've got to know where he's at. He's earned the respect of being called a game wrecker. He's put that on his resume for sure." The Eagles are going to need a career day out of Vaitai whenever he's matched up one on one vs. Griffen, and they'd be wise to give him added help. The book on Kelce over the course of his career has been that he's athletically gifted, capable of making blocks on screen plays, pulls to the outside, and getting up the field to the second level as well as any center in the NFL. On the downside, because of his smaller size, he could often be engulfed by much bigger defensive tackles who were able to push him back into the pocket. In 2017, Kelce was an absolute stud, earning first-team All-Pro honors. He was great as usual in situations where his athleticism was put to use, but he also did as good a job against big defensive tackles as he ever has throughout his career. In 2016 and 2017, Joseph finished second in the NFL in tackles among defensive tackles, both years behind the Giants' Snacks Harrison. He's a big-bodied run stuffer like Harrison, but also has pass rushing skills as well. Because the Vikings like to only rush four in the passing game, those front four players are typically rushing hard up the field, and thus can be susceptible to the screen game. For example, the Saints were able to gash the Vikings on 2nd and 16 last weekend with a screen to Alvin Kamara. A week ago against the Falcons, the Eagles got the screen game going, most notably on a 32-yard catch and run by Jay Ajayi, in which LG Stefen Wisniewski turned into a human wrecking ball. The screen game can help a quarterback enormously. They're easy throws, and they can help make the defensive line think twice about rushing hard after the quarterback in fear of a little screen being dropped over their heads. The easier Doug Pederson can make life on Nick Foles, the better. When the Eagles run screens this weekend, and they will, they have to do a good job disguising them against the Vikings' defensive line, and picking up blocks down the field on the Vikings' talented linebackers (Anthony Barr and Eric Kendricks) and safeties (Andrew Sendejo, if he plays, and Harrison Smith). In my view, Xavier Rhodes is currently the best cornerback in the NFL, though the Jaguars' Jalen Ramsey is right on his heels. In his five year career, Rhodes has had at least 48 tackles as well as double-digit pass breakups every year. At 6'1, 218, he is a very big corner who likes to get physical with opposing wide receivers, and he is a willing tackler in the run game. The Vikings like to allow Rhodes to trail the opposing team's best wide receiver, which in this case would be Alshon Jeffery. That's a bad matchup for Jeffery, who struggles to gain separation, but can be very effective against smaller corners because of his size and catch radius. Rhodes has size, athleticism, and ball skills. Maaaaayyyyybe Jeffery just shouldn't be a big part of the game plan this week. And yes, finally, the Eagles are going to have to find a way to run the ball against the Vikings' stout run defense. The strength of the Vikings' run defense is their defensive line, much like the Eagles'. However, if you can break through that first line of defense, run defense is not a strength of linebackers Eric Kendricks and Anthony Barr, who both excel in coverage and blitzing. The Vikings allowed first downs on just 25 percent of third-down plays this season, which was best in the NFL by a wide margin. The Eagles need to find a way to avoid negative and no-gain runs on early downs, so that they can stay on schedule and leave themselves in manageable third down situations. The key will be to keep the Vikings' defensive linemen from making plays in the Eagles' backfield in the run game.